Happy almost 2018! 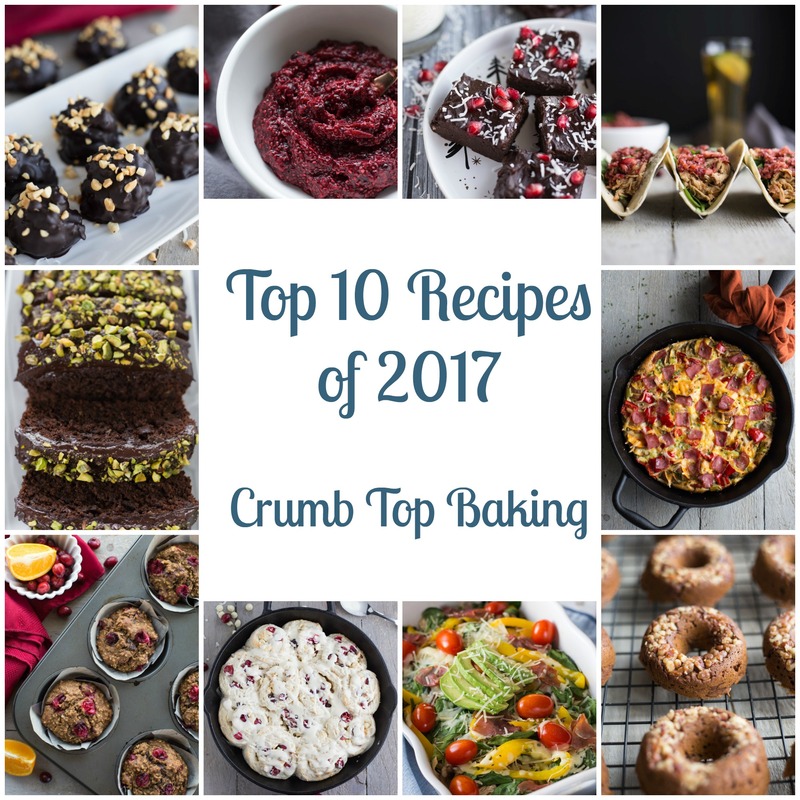 I’m excited to end the year on a positive note by sharing the Top 10 Recipes of 2017 for Crumb Top Baking! I know everyone is saying it, but can you believe we are at the end of 2017?! This year went by so quickly! While I love the start of a fresh new year, 2017 was a pretty good year for me, so I’m extra excited about all the possibilities that 2018 will bring! 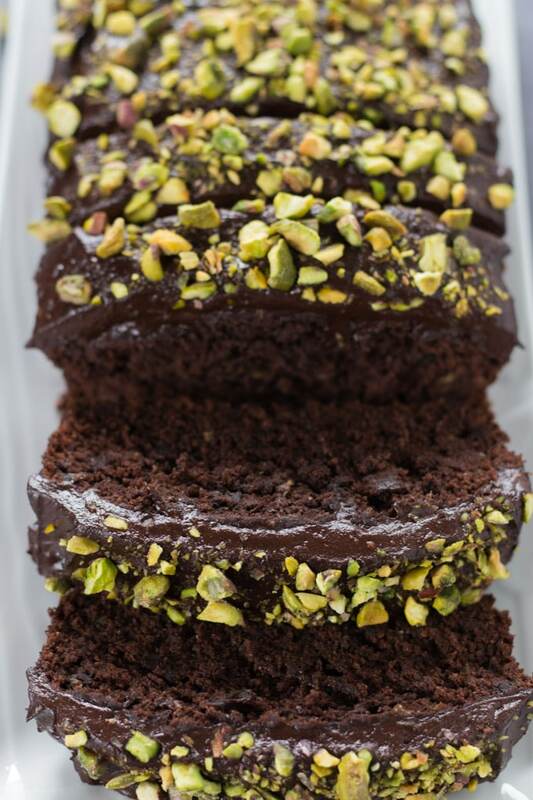 This Dark Chocolate Zucchini Cake was one of my early recipes, and it’s the most requested whenever I’m asked to take dessert somewhere! It’s loaded with cocoa, dark chocolate chips and dark chocolate almond milk. Yes, triple chocolate! And it’s full of clean eating ingredients like whole wheat flour, honey, apple sauce, flax meal, olive oil, avocado and, of course, zucchini! The cake is topped with an avocado icing, which is so simple to make and tastes almost like a buttercream icing! This recipe also has an avocado icing, but this one is spiked with peppermint! I recently shared these Peppermint Mocha Fudge Brownies as part of the Sweetest Season Cookie Exchange, and they quickly entered the top 10 in page views on the blog. 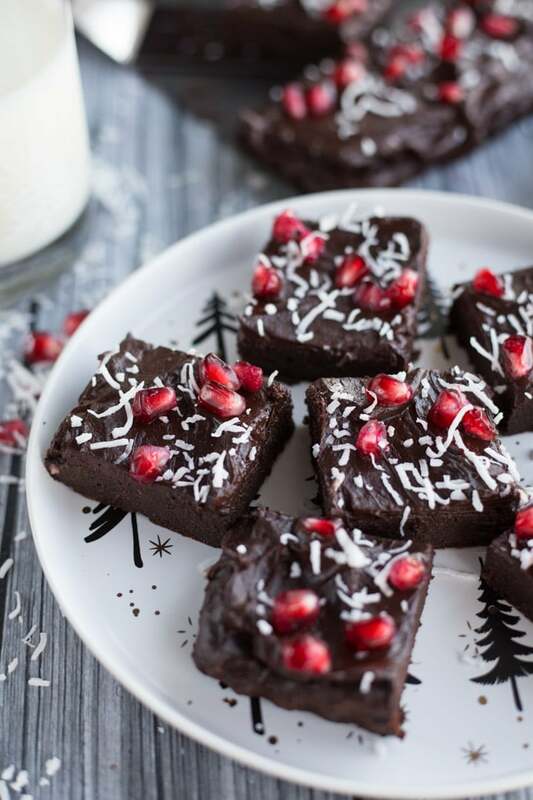 These brownies are chocolatey and fudgy, but made with clean ingredients like avocado, dates, maple syrup, coconut sugar, eggs, whole wheat flour and cocoa. So delicious! 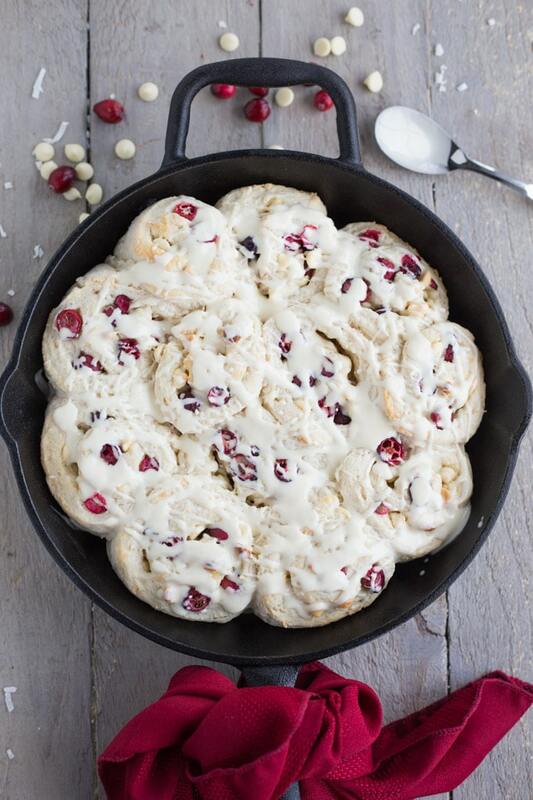 Okay, here is my disclaimer: This recipe for Cranberry White Chocolate Breakfast Buns is not clean eating! This is pretty much the only recipe I have on the blog so far that includes white flour, white sugar and butter! But these are so good, I had to share the recipe. They were a staple at holiday brunches this year, and they can even be made ahead, which makes them perfect for Christmas morning breakfast! Or any day of the year, really! 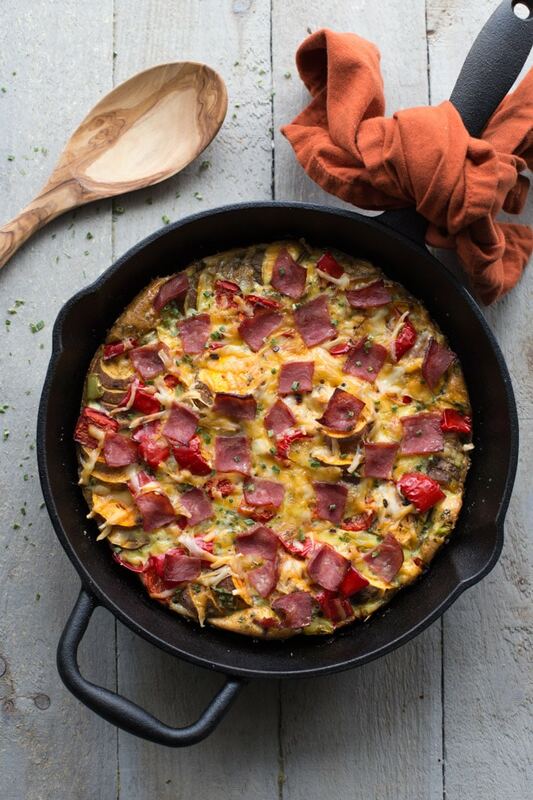 Okay, sticking with brunches, this Savoury Sweet Potato Breakfast Skillet is a personal favourite of mine. And was also on repeat at holiday brunches this year. It’s brimming with sweet potatoes, red peppers, eggs and turkey bacon (plus a little kick from banana peppers and chipotle flakes). It makes an awesome savoury breakfast but you can actually prep it for any meal of the day. I usually enjoy it for lunch with a side salad. To be honest, I was a little surprised that this recipe made it into the Top 10 Recipes of 2017. I mean, I love cranberry sauce and I love chia, but I had no idea a clean eating cranberry sauce would be so popular. 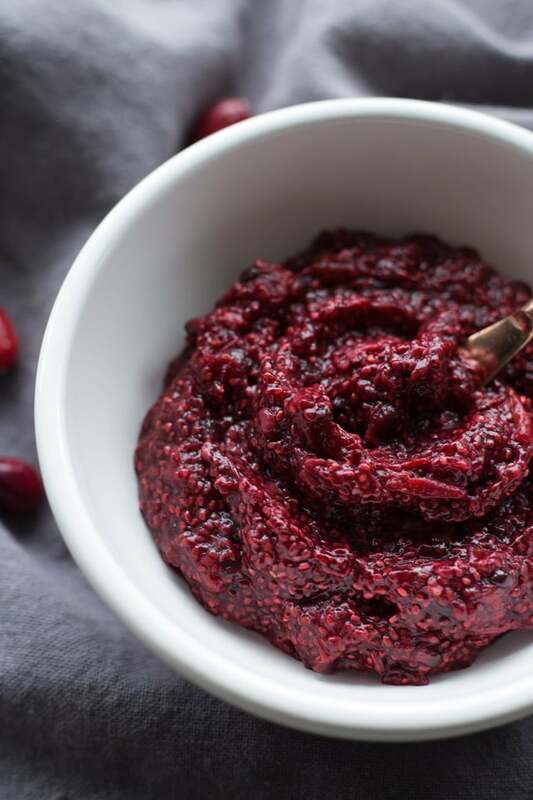 This Blackberry Chia Cranberry Sauce still has the same tart taste as your usual cranberry sauce but it’s sweetened with blackberries and a little bit of cane sugar. And the chia gives it a unique seedy texture, which adds some extra fibre to your meal! 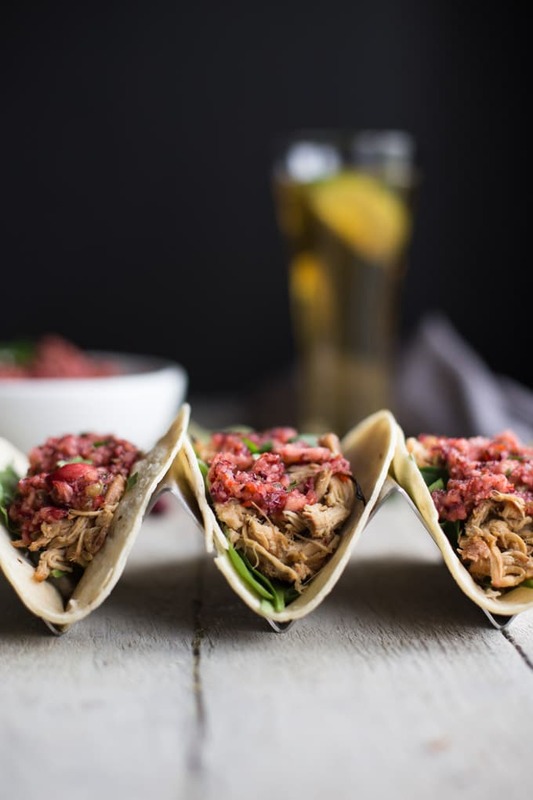 Slow Cooker Apple Cranberry Chicken Tacos are one of my favourite meals to prep on a Sunday to enjoy during the week. The chicken is sweet, savoury and a little bit tart, and pulls apart so easily. I usually pair these tacos with a spicy cranberry salsa, but I also like to freeze the chicken in batches to add to salads for a quick lunch. 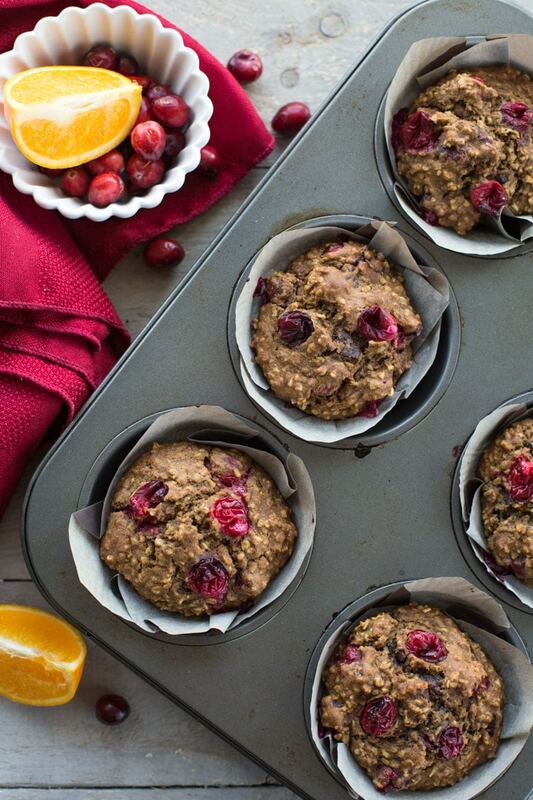 These Cranberry Orange Overnight Oatmeal Muffins make a great clean eating snack or on-the-go breakfast. They include steel-cut oats, whole wheat flour, almond milk, extra virgin olive oil, coconut sugar, cranberries and orange. I like prepping these the night before so whipping together fresh muffins in the morning is a breeze! 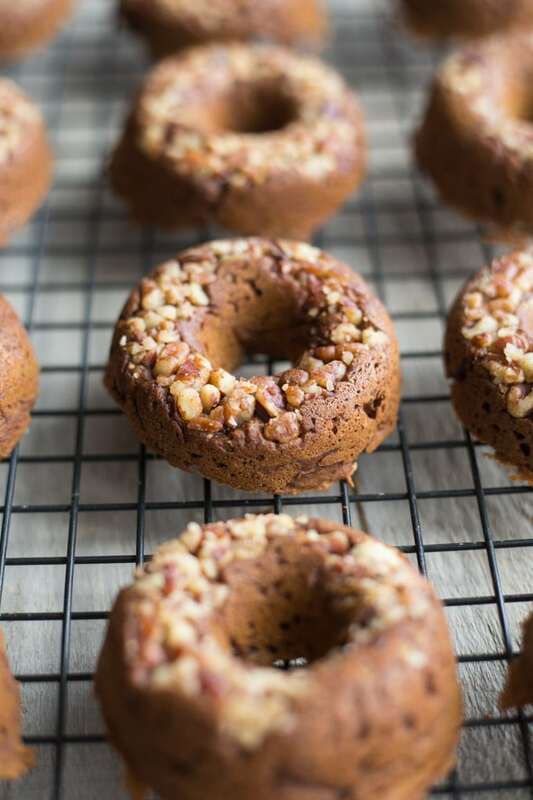 Pumpkin Pecan Protein Donuts are a perfectly spiced fall treat loaded with fibre and protein! They include pumpkin puree, gluten-free oat flour and protein powder. And for a decadent touch, they have pecans baked into the top and an optional dark chocolate drizzle! While this Turkey and Prosciutto Zucchini Bake wasn’t the first recipe I published on Crumb Top Baking, it was an early one, and definitely one of my favourites! I love zucchini noodles, so my spiralizer gets lots of use! This dish, from start to finish, takes just 30 minutes. So you can see why it’s one of my go-to recipes for a quick weeknight meal. And if you’re into clean eating, and don’t have a spiralizer yet, you should definitely get one! 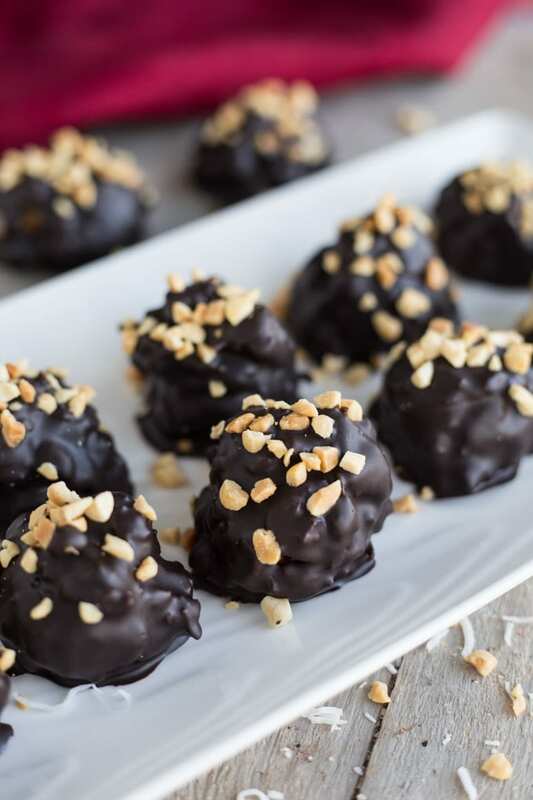 And finally, coming in first on the Top 10 Recipes of 2017 are these Dark Chocolate Peanut Butter Mounds. I was a little surprised, since I only published this recipe in November, but I guess there are some hard-core peanut butter lovers out there just like me! This recipe is on the clean eating side, and includes simple ingredients like raw nuts, natural peanut butter, maple syrup, unsweetened coconut, dark chocolate and brown rice krispies. They are my favourite cookie recipe on the blog so far, so I’m delighted that they are your favourite too! Thank you all for stopping by throughout the year and helping to make Crumb Top Baking an enjoyable place to share recipes! I hope you all have a wonderful New Year’s celebrating with family and friends! I’ll be back next week with my first recipe of 2018!! Thank you Puja! Happy New Year to you too! These all look so delicious! I signed up for your email so I don’t miss any of your new recipes! Thanks Lisa! I hope you enjoy the new recipes! Wow! Only 9 months? 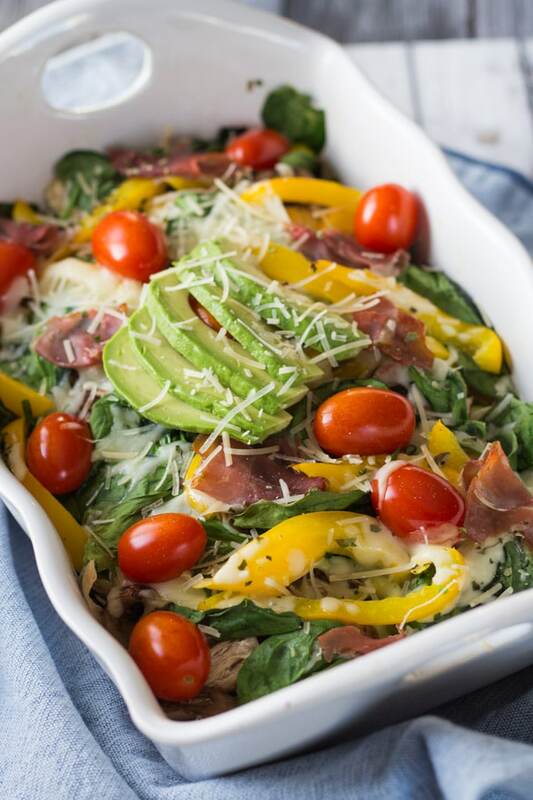 What a great round up of recipes and pics! You should be proud 😉 . Happy New Year!! Thanks Stacey! It’s felt a lot longer than nine months, but it’s been great so far! You have done an amazing job for only being at this 9 months!! I love all of your top 10 – and have tried a few of them myself. Can’t wait to see what 2018 brings for you! Thanks Katherine! That’s so nice of you to say! And I’m so happy you’ve been able to try a few of the recipes in the top ten! Love getting your feedback! I hope 2018 is a great year all around! And I’m looking forward to seeing more of your recipe creations throughout the year! OH MY!! 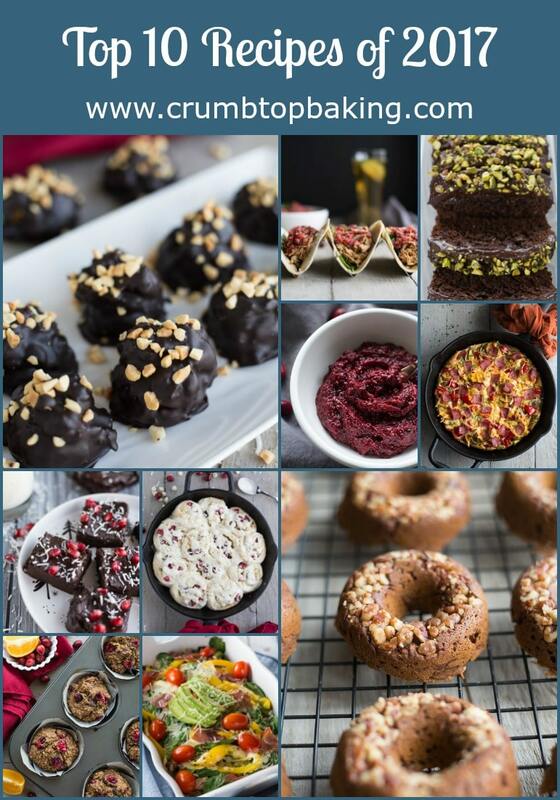 These all look amazing but your #10 also has me hungry….make that starving! Just gorgeous! Here’s to another year of beautiful food! Aww! Thanks Annie! I really enjoyed putting together the top 10 and can’t wait to try some exciting recipes in 2018! You had quite the delicious year, Leanne!! I can certainly see why those Dark Chocolate Peanut Butter Mounds are so popular – can’t beat that combo!! Looking forward to all your delicious recipes in the months ahead 🙂 Cheers to a fabulous year!! Thanks Dawn! I agree! Can’t beat the dark chocolate and peanut butter combo! Hope it’s a fabulous 2018 for you too! This is a great collection of recipes! 2017 was an amazing year….I’m hoping 2018 brings as many delicious recipes as 2017! Keep up the great work! Thanks Kathy! It was fun putting the collection together. I’m looking forward to all the recipes in 2018 too! Thanks Cheyanne! Happy New Year to you too! It was a great 2017! I’m looking forward to 2018 and all it has in store!